Deep differences between developed and developing countries on how to divide the cost of tackling climate change are blocking agreement at the Lima summit. The more that the global climate changes, carbon concentrations rise, and temperatures increase, the more it seems like climate negotiations are stuck in a rut. By Friday, the last day of scheduled talks in Lima, 192 governments plus the European Union had failed to agree on more than a few sentences of the final resolution, dampening hopes that a climate summit in Paris in December 2015 can deliver a meaningful climate deal. The deadlock means the Lima conference is likely to run well into Saturday. The best that can be hoped for is a compromise so weak that it will do little to combat climate change. Fundamental differences between developed and developing countries on how countries are classified appear as entrenched as ever, with major emitters and negotiating blocs adopting familiar positions. Developing countries want the classification of rich and poor nations to remain the same, which would absolve them of the obligation to slow growth in carbon emissions by making big changes to their energy mix and economic policy. Prakash Javadekar, India’s Minister for Environment, Forests and Climate Change, agreed. The deadlock comes at the end of a year in which a global collective of scientists and policy advisers – the Intergovernmental Panel on Climate Change – has given stark warnings that climate change is gathering pace, needing a swift and decisive shift to renewable energy to avoid economically ruinous and catastrophic climate change. As 2014 shapes up to be the hottest year on record, the most that bureaucrats and politicians have managed to do on the treaty text at Lima so far is to list a plethora of conflicting options and to say they will renew negotiations when they next meet in February. By Friday, the draft negotiating text had swelled to 60 pages, threatening a reprise of the build-up to the chaotic Copenhagen Summit in 2009, when divisions between major emitters meant world leaders had no workable draft to agree as a climate treaty. The same basic divisions — said in hundreds of different ways in dozens of meeting rooms in the Peruvian capital — have stalled any significant move to combat climate change, though it is already affecting farm output worldwide; adding to uncertainty over freshwater availability; hastening glacier melt; raising sea levels; and making storms, floods and droughts more frequent and more severe. Bureaucrats and politicians from developing countries have reiterated that rich nations have emitted 80 percent of greenhouse gases currently in the atmosphere, and so bear an historic responsibility to combat climate change and provide finance for low carbon technologies and adaptation to climate change. Their counterparts in industrialised nations have pointed out that China is the world’s largest emitter of greenhouse gases (GHG), and India is the third. They insist that the differentiation between rich and poor nations – worked out in 1992 – fails to reflect today’s reality; so developing countries must commit to control their emissions as well. 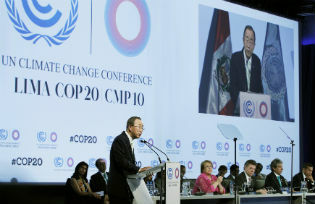 To which developing countries reply that the differentiation is an integral part of the UN Framework Convention on Climate Change and cannot be renegotiated; that they still have millions of very poor people without access to electricity, who have a right to share in the development that the rich world has enjoyed for many decades. A pervading mistrust at Lima has created a recipe for a weak outcome. Just hours before the scheduled close of the conference, an alternate resolution appeared on the UNFCCC website, where it remained for seven minutes before disappearing suddenly. All it managed to do was to renew accusations from some developing countries – most vocally Venezuela and Sudan – that rich nations were trying to do a backdoor deal, in breach of the UN principle of doing everything by consensus among all governments. Such intrigue is a not a new development at climate meetings, but has the potential to generate further ill will. This malaise has also extended to what governments are prepared to tell one another about what they plan to do on their own to combat climate change – in UN-speak, Independent Nationally Determined Contributions (INDC). Developing countries want mitigation of GHG emissions, adaptation to climate change effects, finance, technology and capacity building all included in a country’s INDC. Industrialised countries want national plans to be restricted to mitigation. As fragile agreements started to break down in meeting room after meeting room, delegates started to air their grievances in public, suggesting that Lima will end on a depressingly familiar note. Liu Hongqiao works as analyst for a joint water project of chinadialogue and China Water Risk. Prior joining chinadialogue, she was an award-wining reporter at Caixin Media.